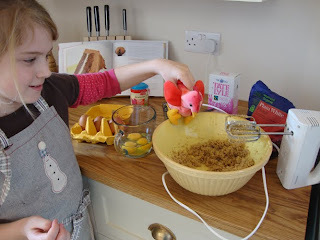 Ernest has had a most enjoyable weekend, the highlight of which being a cake baking session with Mike's daughter, Isobel - she comes to stay every weekend and was very pleased to help entertain our feathered friend! 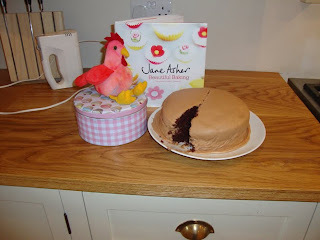 He sampled the first slice himself and seemed to quite enjoy it :-) He is now a fan of Jane Asher. coo ! 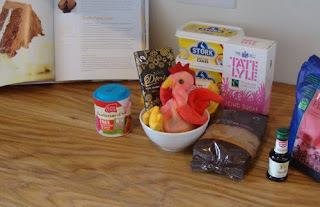 a Jane Asher cake - he can make me one when he comes home ! 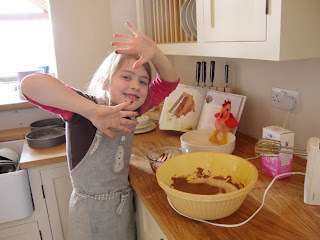 Glad Isobel had a little kitchen hand even if he did try to eat all the ingredients ! Mmmmmm....chocolate cake. That Ernest has very good taste! He's quite handy in the kitchen isn't he lol. Hi Charlotte! I've never heard of Jane Asher! Must find out about all that chocolate cake goodness! Ernest is so comfortable there, but I sense he's always dreamed of Denver or maybe he'd like to go to Australia with me in a couple weeks. Ask him.